Mittwochs mit… Cath von My Bearded Pigeon – Kompromisslos toll. Wie Ihr sicherlich bemerkt habt, habe ich ein Faible für Kissen. Oh ja, ich kann gar nicht genug davon haben. Glücklicherweise kann man die ja relativ einfach ab und zu wechseln. Was würde ich sonst nur tun? Sehr begeistert haben mich in letzter Zeit die Kissen von Cath Young von My Bearded Pigeon. 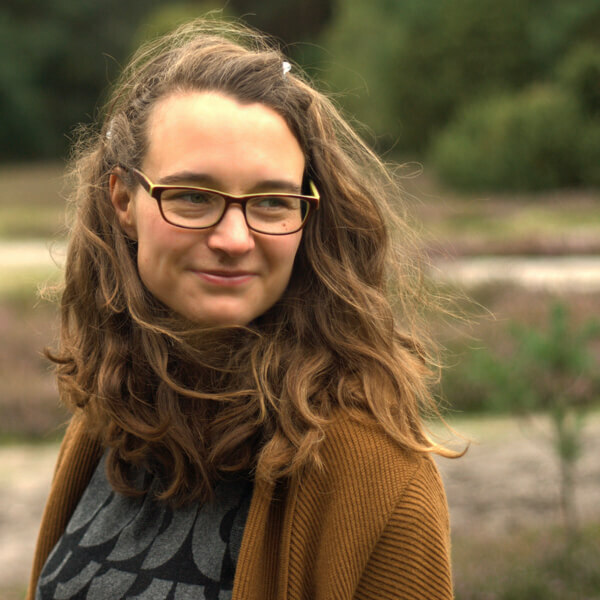 Ich habe sie für Euch interviewt – das Interview ist auf Englisch. Hi Cath. First of all, thank you for agreeing to answer some of my questions for Kompromisslos toll. 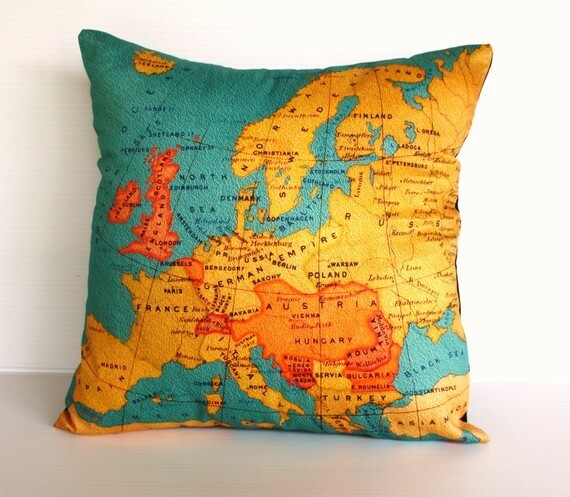 First of all, I am so curious to know: How did you have the idea to print maps on eco-friendly fabric and make cushions of favourite places? 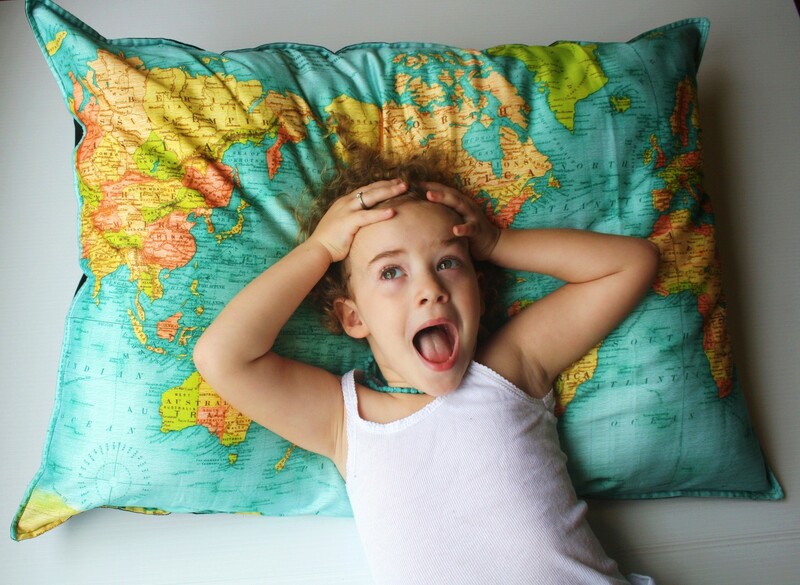 The idea actually came to me when my husband suggested I get a big map of the world and stick stickers onto all the different places I had sold chunkychooky ( my first etsy shop currently on hold) items too….I started thinking about maps, and then fabric and it just went from there. I also knew if I was going to be producing something on mass it would have to be eco friendly- hence the organic cotton. I was also looking for some kind of home wares „thing“ for men as I felt there wasn’t much around cushion covers also were easily posted as I only sell the covers not the inserts and that was obviously a huge consideration when was looking at opening an etsy shop. And how developed that idea to that wonderful etsy shop of yours? I love etsy and love that it is so easy to use, I thought a lot about how to photograph my items, in the end settling for a plain white background. the cushions have only ever been sold on etsy- it didn’t occur to me to do it any other way. 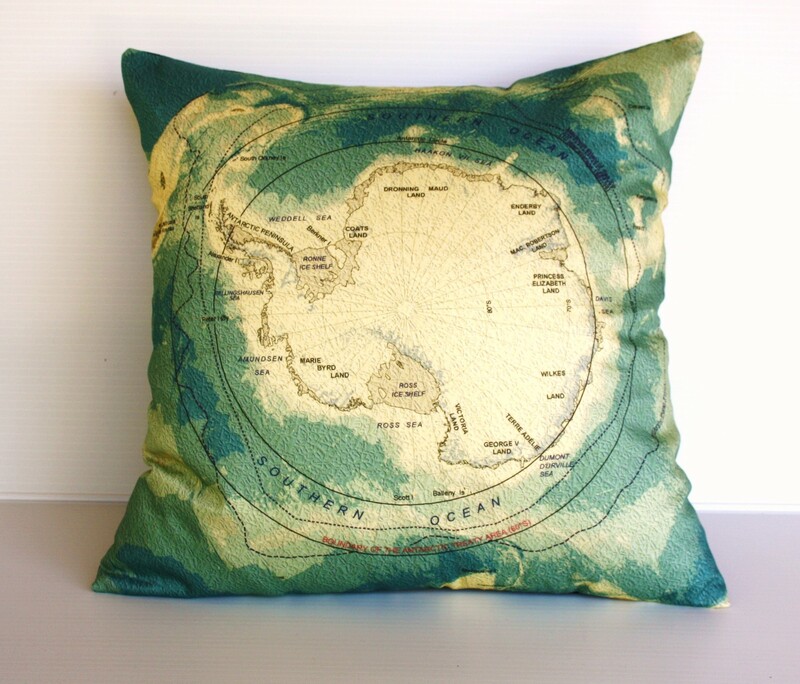 Do you have a favourite map cushion? I am sure you have some special stories about places on cushions up in your sleeve. Do your buyers tell you sometimes their stories of the places they want? People often tell me lovely stories about why they want the map the have ordered… honeymoons, where they met there partner, where they adopted their child from, the hometown they miss and love. I love love love hearing the stories about the places. I saw that your wonderful place was featured on etsy some time ago. I am absolutely hooked by the look of your home! And I love your idea of an eco-friendly home, too. Where do you get your inspirations from? I am inspired by what I can afford! we have just added huge outdoor entertaining area around the house- about 60 square metres we have wanted to do this for a long time but it was important to us that we used Australian hardwood rather than cheap wood from Indonesia so it took us several years to scrape the money together, it is just finished- no pictures yet, but we love it!! And maybe you have a eco-friendly idea for me and the readers of Kompromisslos toll… I am always searching for new inspirations! Just recycle, it really isn’t hard, put a rainwater tank in if you can, consider solar power if you can, don’t use the car as much… all things we know already! Think about what you buy. It is much better to spend a lot of moneyon a good lounge that will last you 10 years than to buy a cheap one and replace it every 2 years- even better recover a vintage one. Cath, thank you so much for granting us a look behind the scenes of the my bearded pigeon – by the way, where does the name come from? The name is completeely made up. I just like beards. And pigeons. I am looking forward to see how you go on with My Bearded Pigeon and your other projects. We’ll sneek in from time to time! Das sind wirklich ganz tolle Kissen! (Jja, davon kann man nie genug haben… :-)…) Und ein schönes, interessantes Interview! Übrigens: Hast du dein besticktes Kissen schon retten können?